Music and video come in a baffling variety of formats — so much so that sometimes you stare at a file's extension and wonder what it even is. Plus, there's player compatibility, device compatibility, playback quality, and 99 other reasons why you may need to change the format of a media file. That's why we've put together a guide on how to convert video, music, and video to music — and as a bonus, how to download an MP3 track from a YouTube video. Converting video to audio — MP4 to MP3, for example — means not so much converting the video file as extracting the audio track from it. That comes in handy when you want to turn your collection of music videos into a playlist to put on an iPod, or distil the sound from a video you took at a concert, or maybe use your favorite La La Land song as a ringtone for your iPhone (please don't, though). Select Services in the drop-down menu, and then Encode Selected Video Files. Select Audio Only as a Setting in the window that opens and click Continue. The M4A file will show up in the same location as the original video and will have the same name. While M4A works well for iTunes, you might want a little more control over the audio format you're getting. 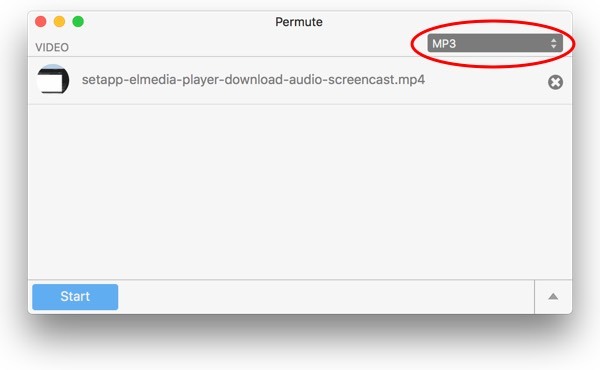 The most common scenario is converting video to MP3, and that's where Mac's built-in converter falls flat. Fortunately, there's a whole range of third-party apps that do the job. Our all-time favorite is Permute: it lets you convert just about any video to just about any audio with a simple drag-and-drop. Plus, it has iPhone ringtone as one of the options, so if you absolutely insist on a custom ringtone, you can finally have it without going through the quest of generating it in iTunes. Open Permute and drag-and-drop the video file into the app. Pick MP3 in the drop-down menu in the upper right corner. How do I convert video and music to another format? "MKV to MP4", "FLAC to MP3", "M4A to MP3" — chances are you typed one of those into Google search at some point, because media file formats can be a pain. Some are way too space-consuming, like FLACs, which can be 10 times bigger than equivalent MP3s. Others are unsupported by your Mac's built-in video player, like MKV. No matter the specific case, you're going to need an audio or video converter to transform the file into a friendlier, more widely used format, which is typically MP4 for video and MP3 for music. Open the app and drag-and-drop your file into it. Select the resulting file format in the upper right corner. Permute supports a few dozen video formats and over 10 for audio, which means it can handle pretty much any media file you throw at it. And by the way, if you're unsure which format you need in the end because all you want is for the file to open on your iPhone or Apple TV, Permute has you covered. You just pick "Apple TV" or "iPhone" as the resulting format and the app will figure out the rest. Long story short, make sure you give it a try, because a media converter simply doesn't get better than this. In case you're just looking for a way to open a video with an uncommon extension, a more advanced player like Elmedia Player can be enough. It supports an impressive array of video and audio formats, so if your file can be played Elmedia will probably play it. Both Elmedia Player and Permute are free to try on Setapp, a subscription service with some 100+ Mac apps and a free trial week. After signing up, you'll get access to all the apps right away. YouTube is a goldmine of music videos, and many people still use it as their primary source of music, even though subscriptions like Spotify are taking over. 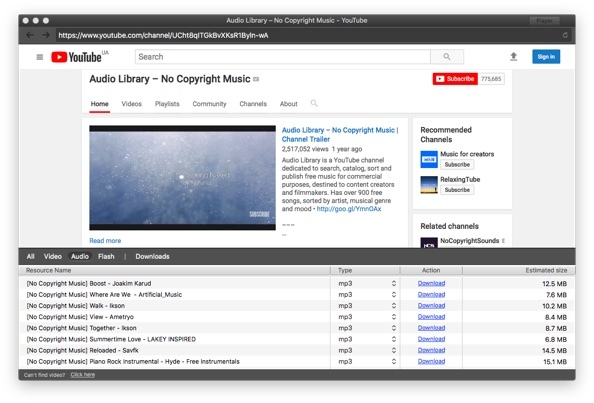 If you're one of them, at some point you probably looked for a "YouTube video converter" — an app that would let you skim music from your favorite videos on YouTube in the form of MP3 files. 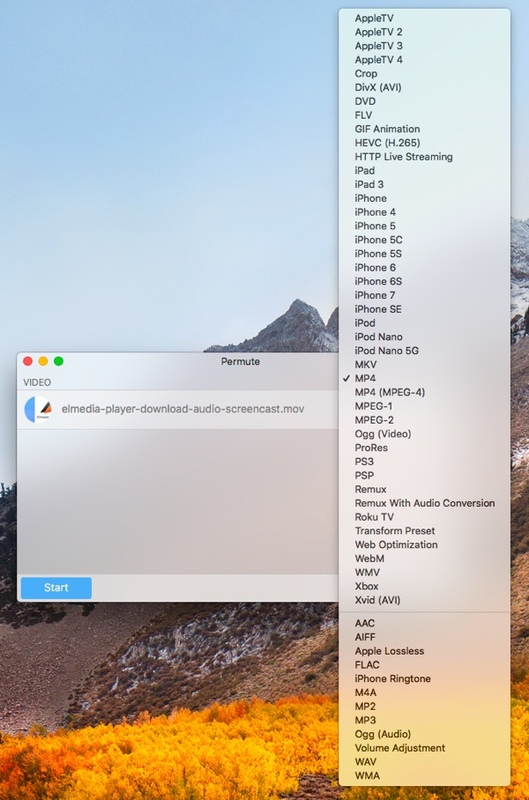 While the term is technically incorrect, because you'd be downloading the audio track from an online video rather than actually converting that video, there are a few good Mac apps that can help you out. Specifically, Elmedia Player, the multifunctional media player we mentioned earlier, and Downie, a simple downloads app for Mac. Important: Before downloading any content from YouTube, make sure you're not violating YouTube's copyright policy. So, let's take a quick look at how this works in both apps so you can decide which one suits you better. Select Extract Audio Only in the Settings in your menu bar. Drag-and-drop the link to the video into the app. Voila! Downie saves the track to Downloads as an MP3 file for your listening pleasure. Elmedia Player might be a little less straightforward, but on the bright side, it gives you more options as to saving and playing all kinds of online media, so it's definitely worth giving a shot. Open the app and switch to Browser mode (click Window in the menu bar and checkmark Browser in the drop-down menu). Paste the YouTube link into the built-in browser and hit Enter. Go to the Audio tab in the menu underneath your video. You'll see the audio track right there. Hit Download next to it. The big plus of Elmedia Player is that you can keep browsing YouTube within the app after you're done downloading, which can streamline the process when you need to save multiple tracks in one sitting. Both Downie and Elmedia Player are Setapp apps, which means you can try them for free, since the first week of the service is on the house. Plus, there are no feature limitations or in-app purchases on Setapp, so it's by far the best way to try the full capabilities of Elmedia Player and Downie without reaching for your wallet. You can just sign up for a free and then see how it goes. Well, that's it: now you're all set to transform music and video files the way you want. Install your new helpful tools and enjoy media content to your heart's content.